How can consultants meet the challenge of BIM Level 2 delivery? 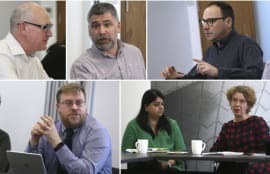 For the third in our series of digital debates, in partnership with the Centre for Digital Built Britain, senior consultants discussed their experiences of working to BIM Level 2 and how they can improve delivery of a digital built Britain. Consultants need to listen carefully to clients’ requirements and support them in finding the best way to implement BIM on their projects. That was one of the key messages that came out of CM’s latest digital round table organised in partnership with the Centre for Digital Built Britain (CDBB). 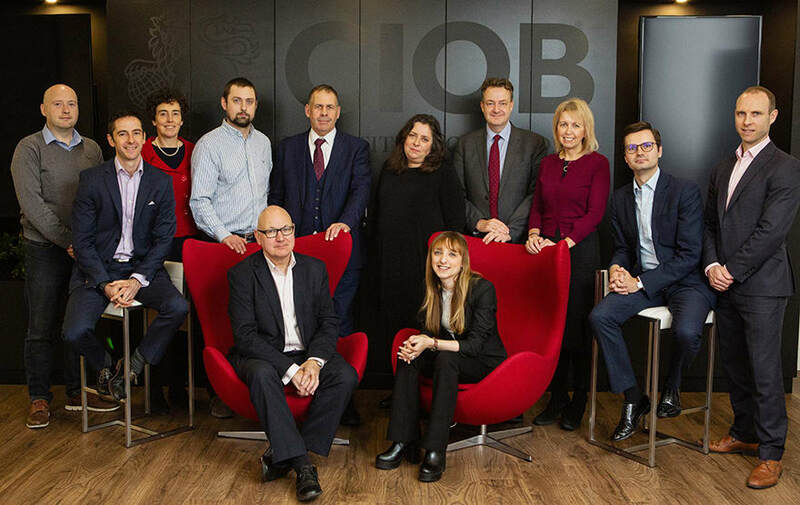 The event, the third of its kind hosted at the Chartered Institute of Building (CIOB) central London office, asked consultants to examine how BIM is currently being adopted to inform the future CDBB agenda, as well as highlight some of the constraints they are facing. The discussion was chaired by Terry Stocks, leader of the CDBB BIM Level 2 workstream, and Fiona Moore, BIM Level 2 programme manager at CDBB. From the start, it became clear the consultants used BIM chiefly on projects where the client requests it. James Colclough, technical director at Aecom, explained that having clients who fully understand the value of BIM helps to drive its adoption through the supply chain. “It is easier where the clients are telling project teams: ‘You have got to do this’. It gives us the ability to communicate why they have got to do it. Change happens more quickly,” he said. Sarah Davidson, associate professor at the University of Nottingham, who also provides consultancy to Gleeds, agreed. “Client leadership is helpful for driving consistency and a whole-project-team approach so that we are, as a team, focused on data,” she said. Consultants generally have a “vanilla” BIM offering, but anything more is usually client-dependent. “Tier 1 constructors reported that their digital approach is similar, in our last round table,” noted Stocks. 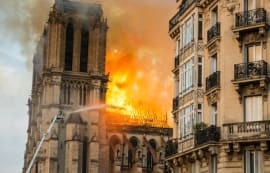 However, while many tier 1 constructors saw benefits from internal efficiencies or risk mitigation in their digital strategies, this was less the case among consultants. “The challenge that we have is that senior people want to talk about BIM Level 2 and smart cities, whereas others are still asking what BIM is. As a business we have to bring those people up to speed,” said Muzvimwe. Colclough felt that project managers can be particularly challenging in this regard, given their focus on capital delivery. “It is quite easy to sell BIM at a high level because they understand the benefits. Project managers are inherently risk averse,” he asserted. Typically, if a project manager sends requests for proposals (RFPs) out to consultants and asks them to price the project for BIM Level 2, a higher price will come back which can be hard to sell to the client, Kent added. A barrier to BIM adoption frequently identified by this group was procurement (see box), while clients were also criticised for being “vague” about what they want. “Quite often one of my senior managers will ask: ‘How do we price BIM?’ They don’t necessarily understand it and see a risk element.” The cost concerns do not arise when the client has clearly described how BIM will be used, he added. 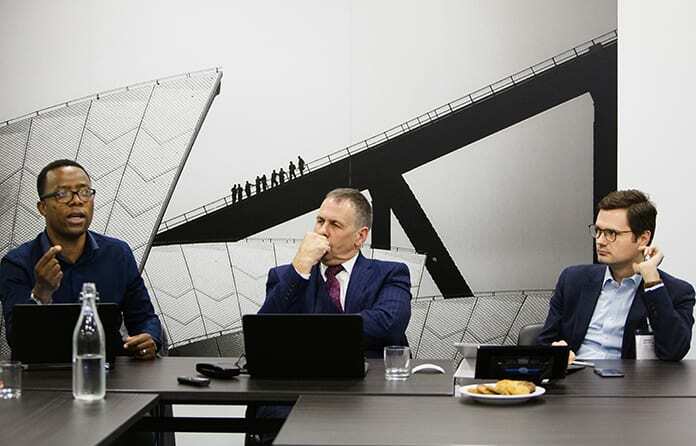 “So there is a role here for consultants to engage with their clients, and support them in developing their data and delivery requirements, to aid clear articulation in the construction tender,” observed Stocks. Mark O’Connor, asset management lead for Wood’s environment and infrastructure division, said he encourages clients to think about the whole life of their asset. “When they start the procurement process or inherit an asset, we say that they don’t inherit assets, they inherit liabilities. And it is only through a strong, quality-assured process and data that they drive that value and turn their liabilities into assets,” he said. Other barriers cited by consultants included limited time to facilitate BIM use early in the design process, which they also saw as an obstacle to design for manufacture and assembly (DfMA) (see below). Jason Whittall, director of One Creative Environments, said he frequently saw confusion about what the BIM process actually involves. “I see a lot of BIM execution plans and proposed BIM deliverables and there is a huge variety in what people think BIM Level 2 is and what they think the process is. PAS 1192 is quite a clear process but it is amazing how many different ways it is interpreted – and these are the people who are advising clients,” he said. “I see BIM as just about information management,” she said. “It is what we have always done. It is part of an ecosystem, where you need inputs to make outputs – and it is the client that generates the inputs. Most members of the group are exploring offering an information management service – advising clients on using data to improve their asset management – but there is limited demand at present. One issue raised was the lack of information manager candidates in the job market, and what that role may look like (see below). Whittall pointed out a link between the information management requirement, the principal designer role in the Construction Design & Management (CDM) regulations, and Dame Judith Hackitt’s report calling for more rigorous duty holder responsibilities and a “golden thread” of information for every building. “Information isn’t just about saving money, it is about environmental factors and safety factors,” he said. “In the oil and gas sector, the duty holder has that role for 30-40 years so tends to value the ‘golden thread’ more,” said O’Connor. Whittall would like to see govern-ment drive BIM harder than just central government mandated departments, pointing out that while departments like the Ministry of Justice have been good at implementing the government’s 2016 mandate, those organisations within the NHS and education that are part-funded by a pension or investment firm sometimes try to argue that the mandate does not apply them. “I think the mandate could be given more teeth,” he said. 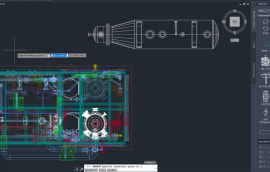 Moore asked the consultants whether design for manufacture and assembly (DfMA) and use of standardised components – together known as platform-DfMA – would enable them to cut down the time required to develop the design. 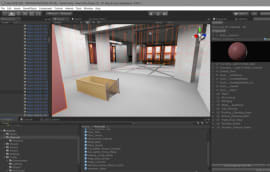 Davidson argued that while these new technologies reduce the total amount of time a project takes, it requires more time up front in order to work up a complete design. “I just wonder, with the way that construction is financed, if that is dissuading this approach,” she said. Kent added: “I think that offsite fabrication is something that should be embraced more. Does it have an effect on the deliverables? No. Does it derisk it in relation to waste and time? Absolutely. How is BIM affected by procurement? “We need to remove adversarial behaviours.” Davidson agreed. 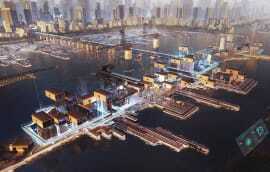 “We can promote BIM as a form of risk management methodology or an assurance process. Grenfell quite clearly shows that we need assurance processes, so there is a will and desire to work differently, but this aspiration is getting squashed through procurement,” she said. “This comes particularly at the point where we engage with the specialist contractors who have got a lot of the design expertise around very complex and sophisticated systems. “With Integrated Project Insurance (IPI), these success criteria are agreed right at the start,” pointed out Hooper. Information management is beginning to emerge as a built environment job role in its own right, but our consultants group find it difficult to recruit for. “It is hard to make the role of information manager attractive to a trained engineer,” said Colclough. Moore asked if the job needs to be filled from someone within the industry, or whether they can be recruited from outside. Whittall doesn’t see it as a construction role. “We are seeing an increase in requests for quotations to provide information management services but there are limited people who can do it and have the right mindset,” he said. Grayham Roper, BIM manager at Hoare Lea, thinks clients need to appreciate the value of employing an information manager. “Quite often the responsibility gets pushed onto an architect,” he said. “The role is about working across people, process and technology and understanding all kinds of information and how they join up on a project. Fundamentally, the information manager should be able to reduce information waste on a project. “But I do think they need construction knowledge,” he added. O’Connor recounted his experience on HS1, where he recruited a data analyst. “After I had my data analyst for about six months, all the other teams on the project wanted one,” he recalled. “It would be great to see large portfolio clients using an information manager that works within the project environment, setting corporate data standards and requirements for asset data,” said Stocks. Consultant designers and managers need to question and challenge clients to identify their output goals – it will help them understand how and why to implement BIM on their projects. Wider internal BIM training is essential to bring the whole business up to speed – not just the digital leaders. Promote more collaborative procurement models to facilitate greater adoption of BIM. Use of BIM during the design phase flushes out errors and should mean quicker capital delivery, while also encouraging DfMA adoption, as understanding of it increases. Think beyond capital delivery and keep in mind how data can be used in the operational phase. Explore and understand the advantages of employing information managers. Remind clients of their duty-holder responsibilities and why BIM adoption fits with Dame Judith Hackitt’s “golden thread”. Capture, measure and share the benefits of using BIM so clients and the wider industry understand its rationale. Work digitally to reduce risk and boost efficiency. “Vanilla” BIM means costs passed on are limited to additional roles or enhanced deliverables. Have to agree with Mac Muzvimwe on the general lack of awareness & understanding of what BIM is? Unlike the UK Government that has made BIM Level 2 a mandatory requirement on their projects since 'Construction 2025' was published, the private sector clients have been selectively adopting BIM. There is a cost associated with not only adopting BIM but the requisite training as well, hence the selective and slow adoption. (Experts in our latest round table suggest client engagement is key). I don't understand CDM regulations states the importance of client participation and the fact that clients are held accountable. How many years has CDM regs been in place. I have seen EIRs that couldn’t deliver on the client’s expectation if that expectation is to quickly populate a PPM system (Planned Preventative Maintenance). Ignorance of both the consultant and the client is usually based on the assumption “well it just happens, doesn’t it?” or “I thought you were doing that!”. I don’t know of any Asset, Space Booking, PPM system (and there are more) that does not have an import tool that takes either spreadsheet, XML or some other transfer data format. For the average computer programmer, it is a standard task of taking input “A” and transforming it to output “B”. However, if you do not put in “A” the Length of life or warranty period, in the expected format, and then the installation/commissioning/warranty start/handover dates (given you choices there 😊) you cannot compute the end life or warranty end dates. This is very basic. So, is it information or data management expertise needed?